Duke followed Virginia's path on Friday by letting a No. 16 seed hang around for about a half before flooring it and winning by double digits, thanks to RJ Barrett's 26 points and Zion Williamson's 25 points. The No. 1 seed Blue Devils defeated North Dakota State, 85-62, after leading by only four points at halftime. Duke advances on to face the winner of UCF-VCU, played later on Friday night. The Bison, winners of the Summit League tournament, had the unenviable challenge of facing the Blue Devils after their win in the First Four earlier this week. Duke is more than just a title contender. There's a reason the Blue Devils are by far the No. 1 pick to win the championship, per the numbers from our bracket contest. This was a four-point game at halftime. North Dakota State was hanging with the Blue Devils, scoring at the same rate Duke was and getting the ball inside just enough. Vinnie Shahid had 13 points in the first half. Duke tightened up its defense and limited Shahid to five points in the second half. And the Blue Devils got another dominant performance from their superstar. It's not uncommon for No. 1 seeds start slow against No. 16 seeds before pulling away. But until the top-seeded team actually finds its stride and turns on the jets, it's fun to hope. Williamson scored 25 points on just 16 shots. He rocketed the Blue Devils into safety with six points in the first four minutes of the second period, and that was pretty much that. Look at this scoop-and-score. 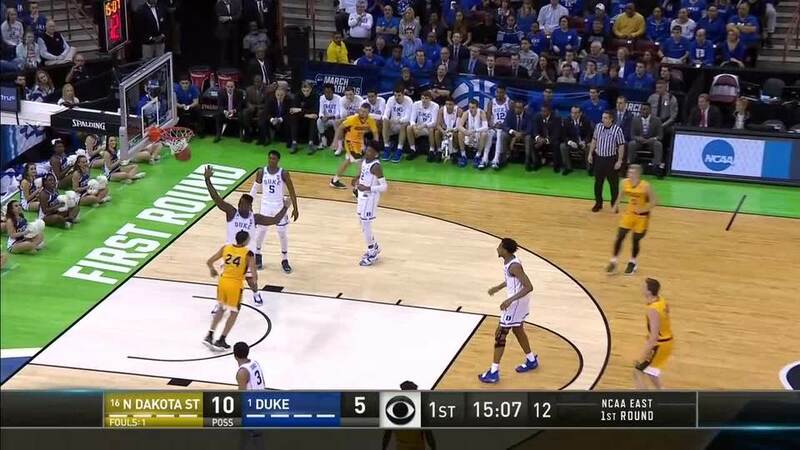 Williamson scores on steals pretty regularly, but a North Dakota State player made his path more difficult here. Didn't matter. While Virginia's game against No. 16 seed Gardner-Webb followed a similar script earlier on Friday, that ended as a 15-point win for the Cavaliers. Duke didn't stop there. The Blue Devils made sure their win went down as a dominant performance with an electric second half that showcased everything that makes them dangerous, and it was fun to watch. No one's gonna want to face this Duke team. Surprise! NDSU proved that just about any team could hang with Duke for a half. But there's a reason the Blue Devils are the favorite to win it all this year. Defending Williamson is an impossible task for just about any team, and when Barrett and Reddish are scoring efficiently, it's over.